Spoiler Alert! This review contains detailed information on the plot and resolution of the novel The Engines of God. It is recommended that you read the book before you read this review. In the realm between hard science fiction and space opera there is a zone where some of the rules of science may be broken very carefully, but the author may still make his or her universe look and feel realistic. 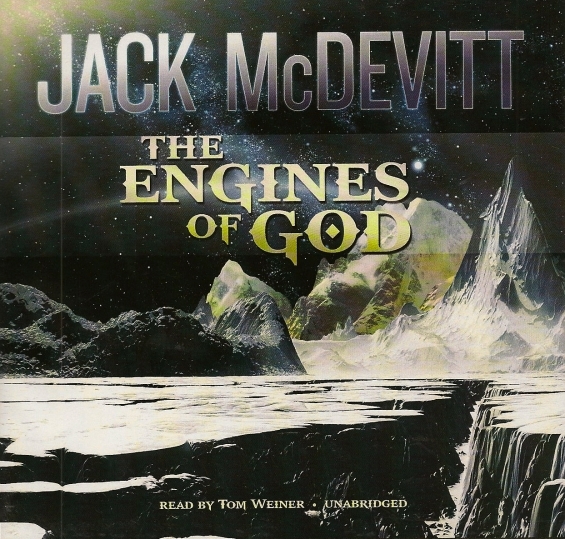 The works of Jack McDevitt certainly belong in that zone and none more squarely than The Engines of God, the first of six novels in what has come to be called “the Academy series”. The novels begin in 2197 and continue deep into the 23rd century. The Academy of the title is the space exploration arm of the North American Union (NAU), with the primary purpose of charting the star systems of our neighborhood along the Orion spiral arm of the galaxy. Each mission clock runs from about a month to a year. Recent discoveries of both a living, alien pre-atomic population on one planet, Inokademeri (Nok) and archeological ruins on two others (Pinnacle and Quraqua) have led to bigger ships, designed to ferry massive equipment and archeologists to study these planets. Along with faster than light space travel, humans now have air cars (similar to the skimmers of the Alex Benedict novels), three-dimensional interactive simulations called simmies (replacing movies) and force fields that may be used in hostile environments (replacing space suits). The protagonist is a pilot named Priscilla Hutchins (everyone calls her Hutch), a diminutive, black-haired beauty imbued with her own particular hang-ups and fears. Hutch is a well-realized character from the beginning. She’s not terribly complicated, but then no one is in this existence nearly 200 years ahead of us and that is part of what gives the novel an edge of realism. Let’s face it, we aren’t very complicated, much as we’d prefer to think otherwise. But there is something in her struggle simply to have a life that we eagerly identify with and we instinctively support her throughout the novel. She is close friends with Dr. Richard Wald, a archeologist and author, who prefers to have her as pilot on his explorations. The archeologists of the future have discovered gigantic sculptures scattered here and there along the Orion rim. Perhaps the most fascinating is an alien’s self-portrait left on the snow-covered surface of Iapetus, the third largest of Saturn’s moons, that is nearly 24,000 years old. The Prologue is soulful writing, as Hutch and Dr. Wald view the sculpture on Iapetus, walk around it and meditate on who the Monument Makers might have been. It is eerie and introduces a mood of almost spiritual reverence for time and space. As an introduction, it sets up the central question of the book: Why did the Monument Makers create their sculptures? Although the novel is divided into five sections, each advances the story significantly and brings us a little closer to answering the question. Part One: Moonrise jumps us ahead in the timeline over five years to April 29, 2202. On the mission to extract the scientists at Quraqua, Hutch and Dr. Wald stop to inspect a Monument on Oz, one of Quraqua’s moons. This sculpture is as large as a city – and in fact looks like a city, though pocked and scarred from some sort of catastrophe. Although the city is almost complete made of right angles, there are two round towers, one at each end of the sculpture and each with a roof sloping away from the Monument. On one of the towers, there is an inscription, unreadable to the scientists, but containing figures from an ancient Quraquan language that has been named Casumel Linear C.
An important character is introduced in Part One in the form of Frank Carson, the administrator of the Quraqua project. An ex-Army man, who works for the Academy, Frank meets Hutch and Dr. Wald at Oz and shows them the inscription. In Part Two: Temple of the Winds, nearly the entire scientific team is imperiled attempting to remove print chase that might contain enough Casumel letters to reconstruct the language enough so that translations can be made. Dr. Wald gives his life attempting to save this artifact which might contain the key to understanding the inscription on Oz. Although an exciting part of the novel, Part Two does not actually advance the plot that much, except to emphasize the importance of cracking the language. Understanding the language occurs in Part Three: Beta Pac when the exophilologist, Maggie Tufu, manages to translate the inscription on Oz. It is a message from the Monument Makers to the Quraqua to “seek us by the Horgon’s eye.” The Horgon was a mythical Quraquan beast, who was also represented in a constellation. Figuring this out, Frank and Hutch manage to calculate star movements over the thousands of years between times and narrow down the possibilities as to which one it might actually be. Training massive radio telescopes on these celestial objects, they discover a transmission which might confirm that they have found the Horgon’s eye – the home of the Monument Makers. A mission is mounted, but the results are not satisfactory. Perhaps the best part of this section is the period of time when their ship is disabled and they watch their oxygen disappear with little hope of rescue. It is tight and very intense – quite well written. But it doesn’t really advance the story. Once they are rescued, however, they discover that the period of intelligence for the Monument Makers has past and that the race has disappeared, their planet left barren. There is another successful action sequence as the group is attacked by crab-like creatures on the planet, but this also does not advance the story. What does move it forward is evidence that this world has also suffered multiple catastrophes – and at almost precise intervals of 8,000 years. There is a connection between disasters on Quraqua, Nok, and the Monument Makers’ home world – and there may even be a connection with Earth. Hutch is once again the impetus for hurling the plot forward. She discovers that there is a connection between disasters on Quraqua, Nok, and Beta Pacifica III, each separated by 8,000 years – and there may even be a connection with Earth. It is Hutch who makes a further intuitive leap by associating these catastrophes with the Monuments. She hypothesizes that the Makers created the monuments as a diversion – an attempt to lure these catastrophes that love right angles away from planets with civilizations. By calculating light year distances, elapsed time and the periods between appearances of whatever phenomenon has created these disasters (they are now calling them dragons), Hutch and Frank are able to accurately predict about where the catastrophe would be due to happen in their time frame. Their mission is detoured from Beta Pac to a system known as LCO4418, where they hope to encounter a catastrophe. Since there are no right angles in the LCO4418 system, Frank and Hutch decide to emulate the Monument Makers by creating their own diversion. They set about cutting right angles into some existing mesas on a moon covered in ice, hoping to lure a dragon. As if on cue, two ominous clouds are sighted moving into the system and one of them changes direction to approach the icy moon. The phenomena are eventually called Omega clouds and they, more than anything else, form the basis for the entire series of Academy novels. The Omega cloud unleashes a violent attack on the moon and even chases down the box-like form of Hutch’s lander and destroys it, as well. This confirms Hutch’s suspicion that someone or something is sending out a force every 8,000 years with the intention of destroying civilizations. The Monument Makers, having figured this out thousands of years before, had attempted to divert the Omegas from destroying intelligent life and then had apparently fled the galaxy to avoid them. The final assumption of the novel is that in about 1,000 years, an Omega will find its way into the solar system and mankind had better be ready. It begins an architectural revolution as all man’s structures are redesigned into circular or ovoid shapes. Of course, the greater question is left hanging: why would anyone deliberately plot the destruction of sentience and create gigantic machines to accomplish the purpose? That question will have to hang until much later in the Academy series for an answer. And he will fire the engines of God.